It’s the battle of the fatties and Yamaha’s VMAX goes head to head with Ducati’s Diavel and proves it’s a little long in the tooth. 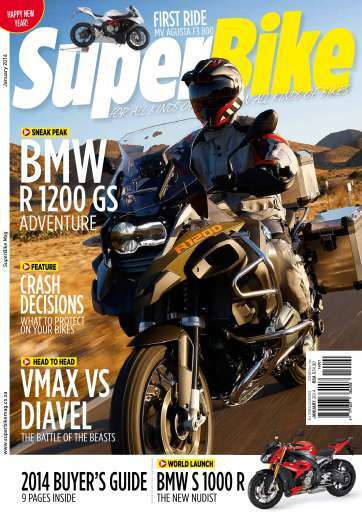 We bring you an in depth feature on the BMW R 1200 GS Adventure which looks mighty good on paper but the proof will be in the proverbial pudding, so to speak, when we ride it later in the year. Clinton goes to Germany and Mallorca to attend the launch of the new BMW S 1000 R and is literally blown away the latest naked bike offering, and he comes back totally in love. Gareth rides the new 390 Duke and we bring you the highs and lows of owning and riding a classic.